This is a HUGE pack of making words activities for use in centers, work stations, or with Daily 5. This is a great Word Work activity. Students use provided letters to make as many words as they can and then try and figure out the mystery word that uses all the letters. 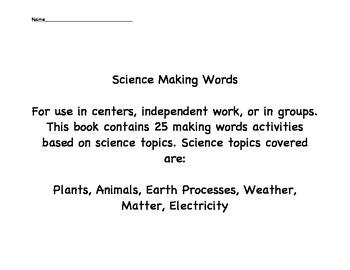 Topics covered include Plants, Animals, Earth Processes, Weather, Matter, Electricity. 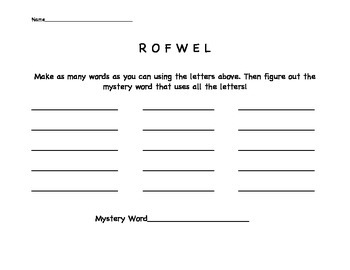 25 different activities are included along with letters to use for hands on manipulation of the letters, recording sheets for each activity and a list of the mystery words for teacher use.